A wannabe entrepeneur attempts to sell cheap plastic surgery to the staff of his sister's non-profit initiative. In one of the many face-palm inducing moments of his presidency, George Dubya Bush is said to have told British Prime Minister Tony Blair that "the trouble with the French is that they don't have a word for entrepreneur." Aside from the obvious linguistic faux pas, Dubya has obviously never met Jacques, the protagonist of I Feel Good, the latest rib-tickler from the comic filmmaking duo of Benoît Delépine and Gustave Kervern. Played by Jean Dujardin, Jacques is a middle-aged shyster chasing a Gallic variation of The American Dream. To put it simply, he wants to get rich quick, without having to put any effort in. While pan-handling passengers on a train, Jacques bumps into an old school friend ("I was second-bottom of our class," the man recalls, leaving us in no doubt who occupied the bottom spot) who has transformed his life, becoming a wealthy CEO, and also his physical appearance, thanks to cheap plastic surgery performed in a Bulgarian clinic. Jacques gets the brainwave of acting as a travel agent for those who wish to go under the knife in the former Communist country at a cut-price rate, but the trouble is he lacks the funds to start up his business, following a misunderstanding at a print shop that sees him charged for 10,000 business cards rather than the hundred he intended to order. Clad in a dressing gown and slippers, having had to flee a hotel when hit with his bill, Jacques rocks up at the commune his sister Monique (Yolande Moreau) runs, a non-profit institution that gives beds to the destitute in return for their work repairing furniture, creating arts and crafts etc. In the poor souls Monique has taken under her wing, Jacques sees the gullible suckers he needs to make his scheme work. Since his breakout role in the Oscar winning The Artist, Dujardin has struggled to find a part worthy of his talents, but in Jacques he's landed the role of his life. Dujardin displays a Cary Grant like ability to make us forget how much of a movie star he looks, allowing us to believe that someone so superficially handsome and charming could be so socially inept and so completely lacking in self-awareness. Jacques' sociopathic lack of a filter leads to the sort of cringe humour that even Larry David might consider going too far, often descending into jaw-dropping misogyny and racism. It's testament to Dujardin's charm that we can hate Jacques while also finding him oddly beguiling - maybe he should run for office! The French film industry churns out comedies that prove huge hits in their native land while failing to find an international audience. Usually it's down to colloquial humour that simply doesn't translate to other cultures, but that's not the case with Delépine and Kervern. Their films tap into global concerns, chronicling the struggles of the many who have been left behind by capitalism and globalisation. 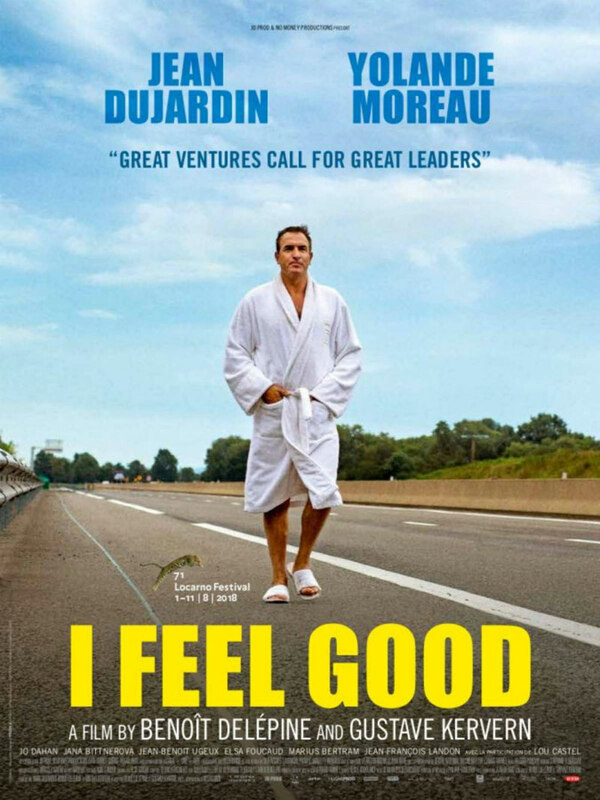 In I Feel Good and their previous film, the Gérard Depardieu fronted laugh-riot Saint-Amour, they've provided hilariously observant studies of middle-aged men who have bought into capitalism's sales pitch, chasing unattainable dreams, climbing a ladder dangling from an ascending helicopter that doesn't have a seat for them. The great trick of Delépine and Kervern is that they give us lower class foils to laugh at while reminding us that they're simply victims of a societal structure that no longer has a need for them. You laugh for 90 minutes; later the anger sets in. But I Feel Good isn't simply a socialist message delivery system, it's a hilarious series of comic vignettes that will have you regularly doubled over in your seat. In terms of its gags per minute ratio, it might be the most laugh-laden film since the 1980s heyday of the Zucker Brothers. Delépine and Kervern have an innate sense of how to block and frame a scene to mine the most laughs from its dynamic, and their backgrounds often contain throwaway gags that lesser filmmakers would struggle to highlight up front. So deep is their well of comedy that at times they'll present a punchline through dialogue while a visual gag simultaneously plays out over a character's shoulder, making a second viewing essential to catch every gag. I Feel Good is a cruelly ironic title given how it applies to the film's characters, but as far as the effect on its audience goes, it's the year's most literal title.